Let us consider these Prisons, then, which with Goya's Black Paintings are one of the most secret works bequeathed us by a man of the eighteenth century. First of all, what we are shown here is a dream. No connoisseur of oneiric matters will hesitate a moment in presence of these drawings evincing all the chief characteristics of the dream state: negation of time, incoherence of space, suggested levitation, intoxication of the impossible reconciled or transcended, terror closer to ecstasy than is assumed by those who analyze the visionary's creations from outside, absence of visible contact between the dream's path or characters, and finally a fatal and necessary beauty. Next, and to give the Baudelairean formula its most concrete meaning, it is a dream of stone: powerfully hewn stone, set in place by human hands, constitutes visually the sole substance of the Prisons, with an occasional wooden rafter, iron jack, or chain; contrary to the program of the Views and Antiquities, here stone, iron and wood have ceased being elemental substances -- they now become no more than a constituent part of the edifice with no relation to the life of things. Animal and plant are eliminated from these interiors where only human logic or human madness rules; no trace of moss touches these bare walls. The natural elements are absent or narrowly subjugated; earth appears nowhere, covered over by tiles or indestructible pavings; air does not circulate -- no puff of wind, in Plate VIII, animates the frayed silk of the flags; a perfect immobility reigns in these great closed spaces. At the very bottom of Plate IX, a fountain rim on which a woman is leaning (and both figure and object seem to come out of the Views of Rome) is the only sign of water's presence in this petrified world. In several plates, though, fire is present; smoke rises from a cauldron strangely set on the brink of the void at a cornice's jutting edge, suggesting an executioner's brazier or a magician's crucible. In reality, it seems Piranesi chiefly delights in setting the smoke's pale and shapeless ascent against the verticality of the stones. Nor does time move any more than air; the perpetual chiaroscuro excludes the very notion of the hour, and the dreadful solidity of the structure defies the erosion of the centuries. When Piranesi could not help introducing into these buildings a rotting beam or a noble patch of ancient wall, he sets it, like a precious jewel, in the midst of some timeless masonry. Finally, this void is sonorous: each Prison is conceived as an Ear of Dionysus. Just as in the Antiquities one heard the faint echo of an aeolian harp in the ruins, the rustling of the wind in the weeds and rushes, here the roused sense of hearing perceives a formidable silence in which the lightest footstep, the faintest sigh of the frail and diminutive strollers lost in these aerial galleries would echo from one end of the enormous structures to the other. Nowhere sheltered from sound, one is nowhere sheltered from sight either, in these hollow, apparently vacated chambers linked by stairs and gratings to other invisible chambers, and this sense of total exposure, total insecurity, perhaps contributes more than all else to making these fantastic palaces into prisons. The irrational world of the Prisons dizzies not from its lack of measurement (for never was Piranesi more of a geometrician) but from the very multiplicity of calculations which we know to be exact and which bear on proportions which we know to be false. For these figures high on a gallery at the back of the hall to have such infinitesimal dimensions, this balcony, which is extended by still more inaccessible cornices, would have to be separated from us by hours of walking, and this discrepancy, which suffices to prove that this somber palace is only a dream, fills us with an anguish analogous to that of an inchworm trying to measure the walls of a cathedral. Often the arch of a vault in the upper part of the image conceals the top steps of a staircase or the end of a ladder, suggesting heights still loftier than those of the steps and rungs visible; the hint of another staircase plunging lower than the level on which we are standing warns that this abyss is also to be extended beyond the plate's lower margin; the suggestion grows even more specific when a lantern hung almost on a level with the same margin confirms the hypothesis of invisible black depths below. Moreover, the artist succeeds in convincing us that this disproportionate hall is hermetically sealed, even on the face of the cube we never see because it is behind us. In the rare cases (Plates II, IV and IX) where an inaccessible opening gives onto an exterior itself imprisoned by walls, this sort of trompe l'oeil merely aggravates the nightmare of closed space in the center of the image. The impossibility of discerning any overall plan adds another element to the discomfort inspired by the Prisons; we almost never have the impression of being in the main axis of the structure, but only on a vectorial branch; the preference of the Baroque for diagonal perspectives inevitably gives us the feeling we exist in an asymmetrical universe. But this world without a center is at the same time infinitely expansible. Behind these halls with their barred bull's-eyes, we suspect there are other halls just like them, deduced or deducible in every direction. The frail catwalks, the drawbridges in midair which almost everywhere double the galleries and the stone staircases, seem to correspond to the same desire to hurl into space all possible curves and parallels. This world closed over itself is mathematically infinite. Ah well. A private interest it seems. 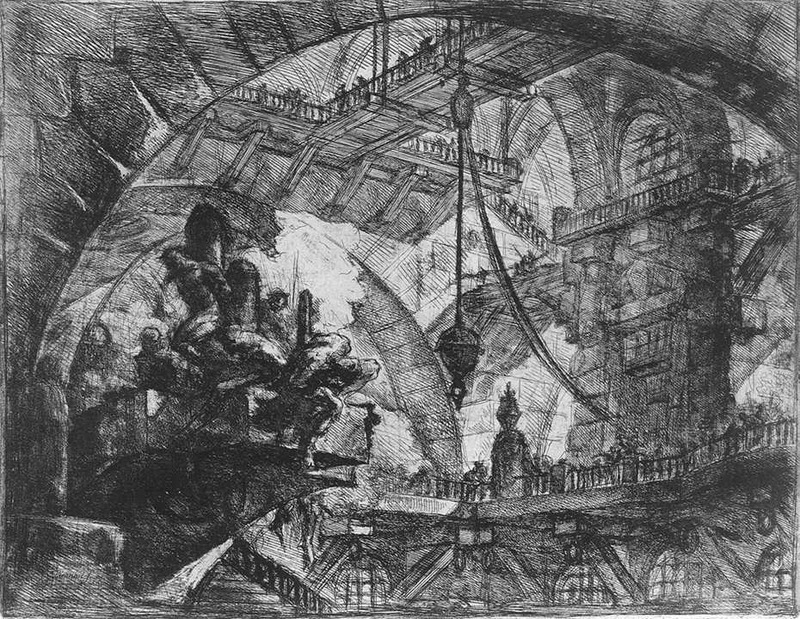 Piranesi saw through things. Pictures of the way it is to live in the world -- what the world really looks like -- baroque-leaning doodlers everywhere, beware. A fellow removed from an Ozzie passenger airliner two days ago when a fellow passenger snooped and saw him drawing curious cartoons in his notebook. Threat level high. Retardation level advancing. Last faint signals of human intelligence disappearing Down Under. So what else is new. 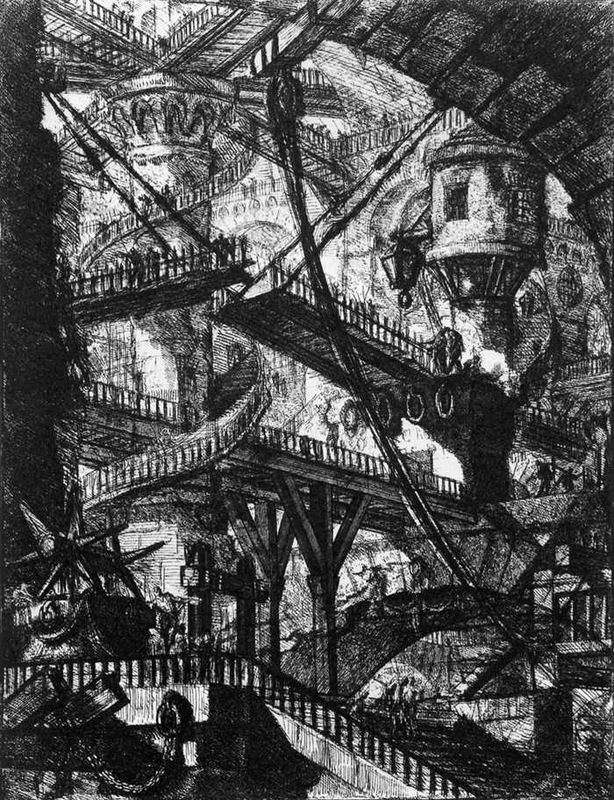 Not in any way to imply that the claustrophobic prison universe of Piranesi's prophetic nightmare vision bears any resemblance to our own timeless Happy Valley. Yourcenar, oddball that she was, was for some odd reason prompted to see some obscure link. 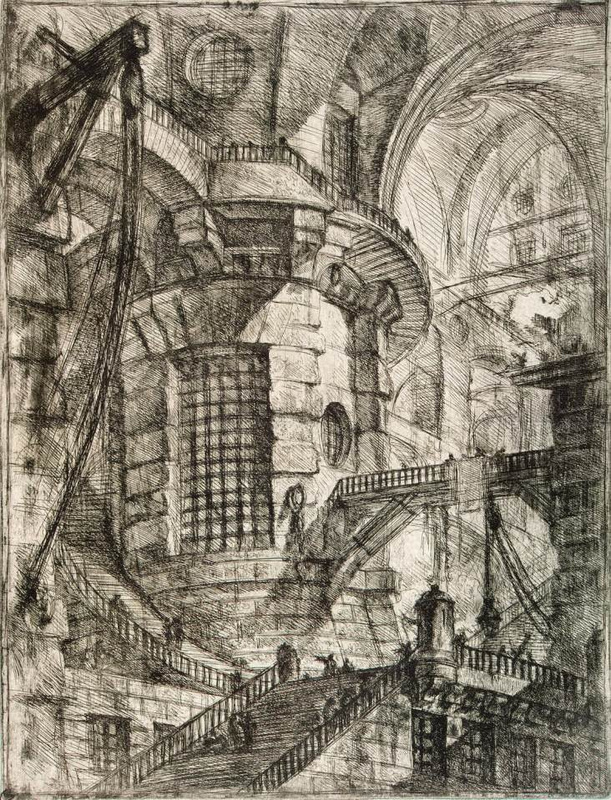 The essay on Piranesi's terrifying Imaginary Prisons came late in a very long life. It did not represent a strictly "academic interest". She draws the connection explicitly enough. "We cannot help thinking of our theories, our systems, our magnificent and futile mental constructions in whose corners some victim can always be found crouching." I know Piranesi for his views of Rome, which show people going about their lives among the ruins of ancient Roman buildings. I never knew about his Prisons, but it makes sense -- he had a gift for capturing views of hidden-in-plain sight behemoths. Yourcenar, always as impeccably thorough in her researches as she is original and poetic in her critical perceptions, very helpfully stages the commercially successful artisanal work of the generic *Views* and *Antiquities* as backdrop for approaching the extremely spooky *Prisons*. "But these images, which in many respects refer to a fashionable genre, deliberately depart from it by their intensity, their strangeness, their violence -- as if struck by the rays of a black sun. If, as asserted, the delirious *Prisons* was created in a fit of fever, the Campagna's paludism favored Piranesi's genius by momentarily releasing certain elements which seem to have been repressed to the last, merely hinted at in his work. "We must define the word 'delirium'. 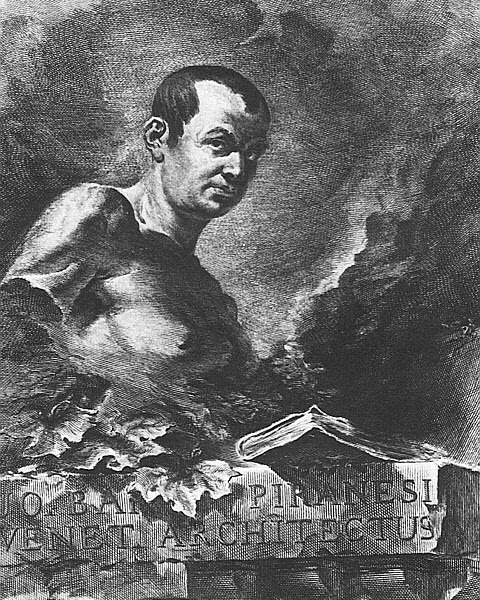 Supposing his legendary malaria of 1742 to be authentic, fever did not open for Piranesi the door to a world of mental confusion, but to realms dangerously vaster and more complex than the one the young engraver had hitherto lived in, though composed after all of virtually identical materials. It increased the artist's perception to the point of erethism, and almost to torment, making possible on one hand the dizzying energy, the mathematical intoxication, and on the other the crisis of agoraphobia and claustrophobia combined, the anguish of captive space from which the *Prisons* certainly resulted." The whole of the essay is a wonder, I'd have typed up more of were not that the advance of degenerative arthritis now turning wrists and hand into unmanageable faulty knobs, resulting in a slow procession of blundering keystrokes that is as depressing to squint upon as it is painful to produce. The full set of plates may be seen at various sites. The Romanians are usually very numerous in these waters. Thank you for the further links, Tom! The video is especially satisfying. There's something about being able to sink inside the image that creates an almost dream-like sensibility (a bit nightmarish, sure, but also compelling -- the kind of dream that keeps you turning back onto your pillow in the hopes that it will continue). And for the record, the un-garbled soundtrack is Bach's Cello Suite #2 in D Minor, which I think I might just listen to for the rest of the afternoon. I found this post after viewing a comprehensive Piranesi exhibit in Rome. Thsnk you for retyping key elements of the Yourcenar essay that capture the prison series so well. I particularly like the phrase "victims found crouching." 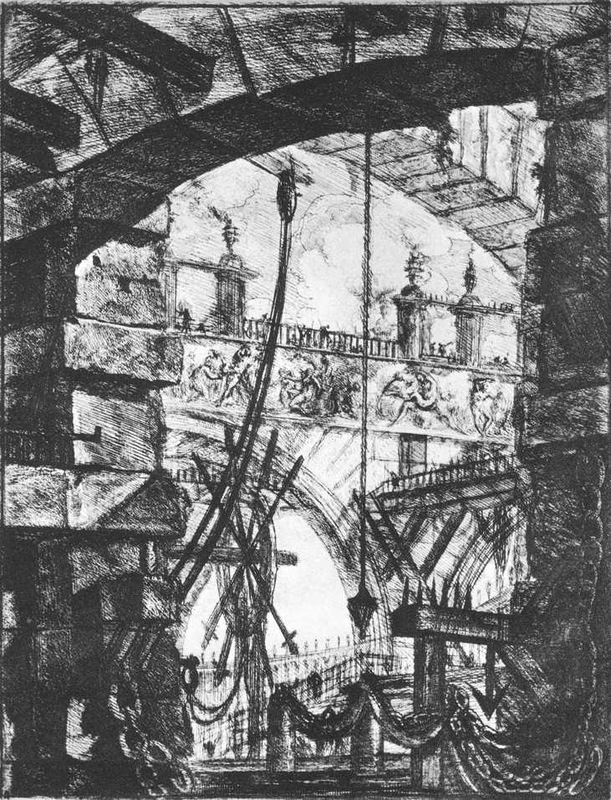 In Piranesi's other work, figures are either leaning on staffs, oppressed, or expounding with arms outstretched, oppressing others with their opinions. Thank you, Richard. Something so familiar -- "contemporary?" -- in this: "...either leaning on staffs, oppressed, or expounding with arms outstretched, oppressing others with their opinions."